For Franklin Delano Roosevelt, the 32nd president of the United States, Springwood, the family estate on the Hudson River in Hyde Park, New York, was “home” throughout his busy life. 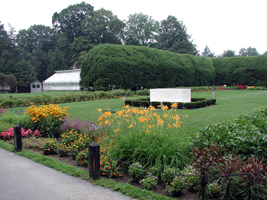 On this estate, the Home of Franklin D. Roosevelt National Historic Site, he was born in 1882, spent his youth, and lies buried. On the eve of several elections in which he ran, Roosevelt waited on the terrace to greet the torchlight parade of his friends and neighbors that made its way up the long driveway to wish him well. He gave the house and grounds to the United States, and they remain largely unchanged since his death. The house is still full of his personality. His boyhood collection of stuffed birds is in the hall. 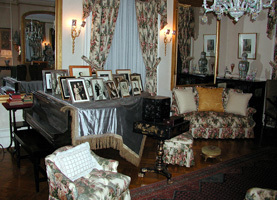 The bedroom that he used as president, with its beautiful view across the lawn down to the river, is as he left it in March 1945, shortly before his death. Franklin Delano Roosevelt (FDR to most Americans) carried the nation through two of the greatest crises in its history: the Great Depression and World War II. The child of a wealthy family and only son of a doting mother became the champion of the common man. Uncomfortable with theory, he was willing to try any policies that might help deal with the nation’s problems. The Supreme Court declared some of these, such as the National Recovery Act, unconstitutional, but many, like Social Security, became permanent parts of the American political system. He found ways to share with Americans, during the darkest days of the 1930s and 1940s, the unshakable optimism and strength of character that helped him overcome the polio that paralyzed his legs. Hated by some, but loved by many, he served as president for an unprecedented 12 years, breaking the two-term tradition George Washington established. When he died, on April 12, 1945, it was like a death in the family for millions of Americans. The original home at Hyde Park dated from around the turn of the 18th century. James Roosevelt, Franklin’s father, purchased the 110-acre estate in 1867, naming it Springwood. The Roosevelts were wealthy and prominent members of New York society. James made a number of additions to the house, though it was never as grand as the neighboring Vanderbilt mansion. 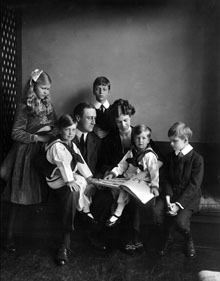 Born at Springwood in 1882, Franklin Delano Roosevelt was the only child from his father's second marriage to Sara Delano. The Roosevelts had a house in New York City and summered on Campobello Island in Canada, but loved their peaceful home overlooking the Hudson River. Educated by private tutors as a child, Franklin left home at the age of 14 to attend preparatory school. He graduated from Harvard in 1904 and married his distant cousin, Eleanor Roosevelt, the following year. Sara Roosevelt, who inherited Springwood on the death of her husband in 1900, invited the couple to come live with her. Although Roosevelt had no need to support himself, he soon became interested in a career in politics, probably inspired by his cousin Theodore. He won election to the State senate in 1910 as a Democrat. Reelected in 1912, he supported Woodrow Wilson's presidential candidacy at the national convention. In 1913, President Wilson rewarded him by appointing him assistant secretary of the navy. In 1915, Franklin and his mother made the last and most significant changes to the Springwood house, enlarging it and giving it a new look. They transformed it from simple clapboard farmhouse in the Federal style to a grand stucco-and-fieldstone mansion in the Colonial Revival style that Roosevelt loved. They upgraded the plumbing and electrical systems and added new wings to house Franklin and Eleanor’s growing family. A new formal terrace with a balustrade and an entrance portico disguised the piecemeal construction process. FDR and Sara added the north wing to the house and enlarged the south wing. They also added a third floor. Roosevelt’s run as the vice presidential candidate in James M. Cox’s unsuccessful presidential campaign gained him national recognition, but tragedy struck the following year. While vacationing on Campobello Island, Franklin Roosevelt fell ill with polio; he would never again walk unaided. The support of his family and his own reserves of inner strength helped him through a long recovery. As usual, Roosevelt sought refuge at Springwood, where his strength slowly returned. His mother thought he should retire, but his wife worked tirelessly to help him keep his political career alive. Roosevelt regained the national spotlight first in 1924, with his “Happy Warrior” speech nominating Al Smith at the Democratic National Convention. Elected governor of New York in 1928, he soon gained attention as a reformer. In 1932, as the Depression was deepening, Roosevelt won the Democratic presidential nomination. Delivering an unprecedented acceptance speech at the convention, he pledged a "New Deal" of relief, recovery, and reform. Roosevelt swept the nation. During the four months between Roosevelt's election and his inauguration, the Depression worsened. Industrial production plummeted; the pace of factory closings accelerated; unemployment soared; breadlines lengthened; and runs on the banks by panicking depositors brought the banking system close to collapse. Roosevelt immediately summoned Congress into an emergency session. Legislation passed during his first "100 Days" was far-reaching in scope and significance, a sweeping program to bring recovery and relief to business and agriculture, to the unemployed, and to those in danger of losing farms and homes. In a series of radio "fireside chats" (two of which were broadcast from the Presidential Library at Springwood), Roosevelt reached into the homes of Americans across the country explaining programs and policy and providing hope for the future. The New Deal did not win the favor of everyone. Many businessmen and bankers saw Roosevelt's programs as "socialistic" and a danger to capitalism and democracy. The Supreme Court declared some key pieces of New Deal legislation unconstitutional. Roosevelt easily won re-election in 1936, but weakening support in Congress, partisan conflict, labor unrest, and an unexpected economic downturn in 1937 took much of the impetus out of the New Deal. The nation did not fully recover from the Depression until the approach of World War II set off an unprecedented employment boom. By the end of his second term, the worsening international situation became Roosevelt’s primary concern. He grew increasingly concerned about the aggressive policies pursued by Adolf Hitler in Germany, Benito Mussolini in Italy, and militarist leaders in Japan. Although neutrality legislation passed during the 1930s inhibited his freedom of action, he recognized the need for military preparedness. Many Americans were isolationists and opposed intervention even after Hitler invaded Poland in the fall of 1939, beginning the Second World War. It was not until 1940 when France fell and Great Britain stood alone against the Nazis that Roosevelt was able to launch an improvised “lend-lease” program to provide direct assistance to the Allies. Convinced that maintaining continuity in government was critical, Roosevelt reluctantly decided to run for an unprecedented third term, defeating Republican Wendell Willkie by 5 million votes. The surprise Japanese attack on Pearl Harbor on December 7, 1941, put an end to isolationism. Within days, the United States declared war on the Axis powers of Germany, Italy, and Japan. As they had been during the Depression, Roosevelt’s optimism and confidence were critical during the darkest days of the war. He mobilized the nation, defined war aims, and conferred with the leaders of the Allied states, most notably Winston Churchill and Joseph Stalin. He began work on the creation of the United Nations, which he saw as the only way to prevent future world wars. In 1944, he was ill and weary of war, but decided he had no choice but to run again for president. Inaugurated to a fourth term in January, he served only a few months, dying of a cerebral hemorrhage at Warm Springs, Georgia in April. The nation mourned his passing. As he had requested, his body came home for burial. His grave and that of his wife lie in the Rose Garden at Springwood. 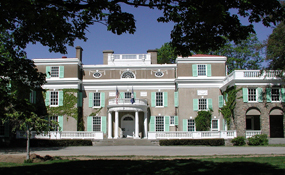 Home of Franklin D. Roosevelt National Historic Site, a unit of the National Park System, is located at 4097 Albany Post Rd., Hyde Park, NY. Click here for the National Register of Historic Places file: text and photos. The park is open daily year-round, except for Thanksgiving, Christmas, and New Years Day. The grounds are free and open to the public dawn to dusk. Buildings are open from 9:00am to 5:00pm. The Historic Site contains the Springwood house, numerous historic outbuildings, and the Presidential Library and Museum, created by Roosevelt before his death and operated by the National Archives. Visitors should begin at the Henry A. Wallace Visitor and Education Center, where they can arrange for self-guided tours of the Presidential Library and Museum and ranger-led tours of the historic house. Visitors should plan to spend a minimum of 2 1/2 hours. Tours to Top Cottage, Franklin Roosevelt’s personal retreat, depart by shuttle from the Visitor and Education Center and last 1 1/2 hours. For more information, go to the National Park Service Home of Franklin D. Roosevelt National Historic Site website or call 1-800-FDR-VISIT. Eleanor Roosevelt’s Val-kill Cottage, the first National Historic Site dedicated to a first lady, is 2 miles east of Springwood. The home is the subject of an online lesson plan, Springwood: Birthplace and Home to Franklin D. Roosevelt. The lesson plan has been produced by the National Park Service’s Teaching with Historic Places program, which offers a series of online classroom-ready lesson plans on registered historic places. To learn more, visit the Teaching with Historic Places home page. The National Park Service’s Historic American Buildings Survey has documented the Springwood house, as well as the Icehouse and the Superintendent's Cottage. Visit the National Park Service Virtual Museum Exhibit on Franklin Delano Roosevelt.